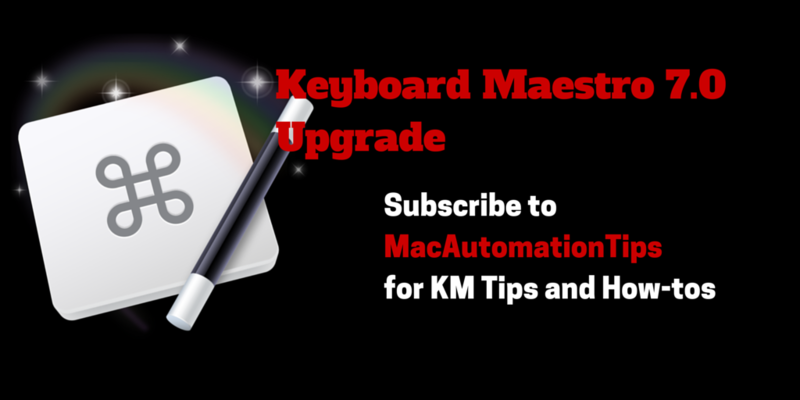 The granddaddy of all Mac automation programs, Keyboard Maestro has just released a new 7.0 upgrade that includes powerful new triggers and actions, and additional ways to filter your macros. Today’s 7.0 upgrade comes with a list of over a hundred new actions, macro additions, editor improvements, Engine additions, and minor changes and improvements. 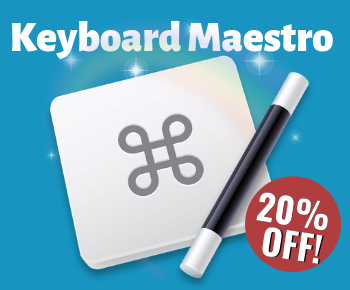 And for a program as powerful as Keyboard Maestro, its price tag is just $18 for the upgrade, or $36 for a new purchase of the program. I haven’t had a chance to dig my hands deep into the all the new features, but here are a few upgrade features that have already caught my attention. 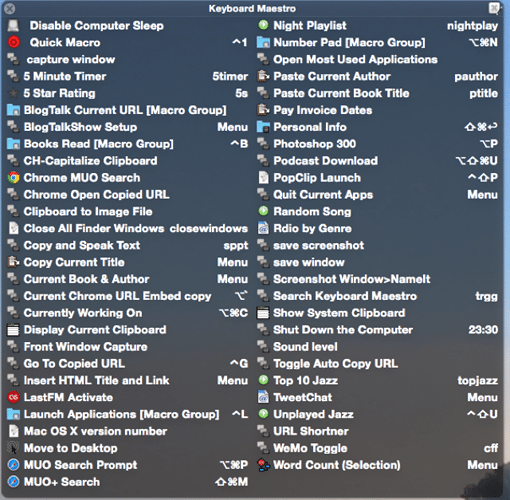 In the KM Editor, macros can be grouped into folders for management and execution purposes. The new upgrade includes Smart Groups, which can automatically filter macros based on the criteria you provide. For example, a simple search string for “iTunes” automatically groups all my iTunes related macros. When you click on the Smart Group button at the bottom-left of the Editor, or use File > New Smart Group, Keyboard Maestro will suggest a search criteria that you might be interested in using. You can either keep it or replace it with your own criteria. Unlike iTunes smart playlists, the KM Smart Groups feature doesn’t include ready-made parameters to define the rules. You will need to be familiar with the search strings to define your search. 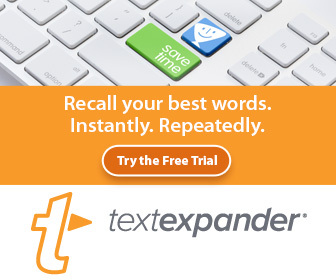 I will share sample search strings as I learn them. 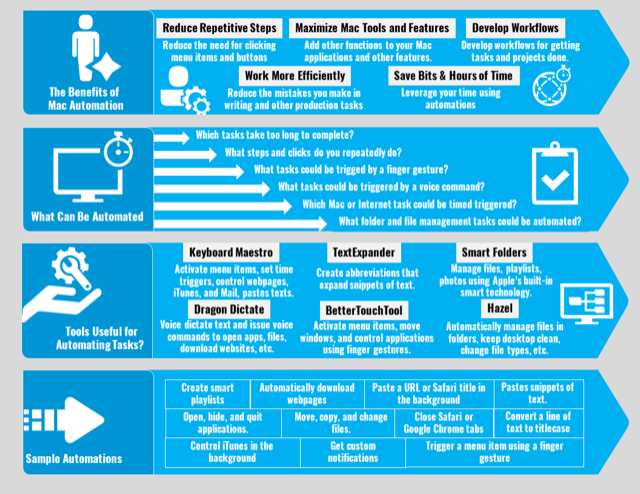 My brain is already lighting up with ideas for using the Clipboard, Wake, Mounted Volume Triggers. 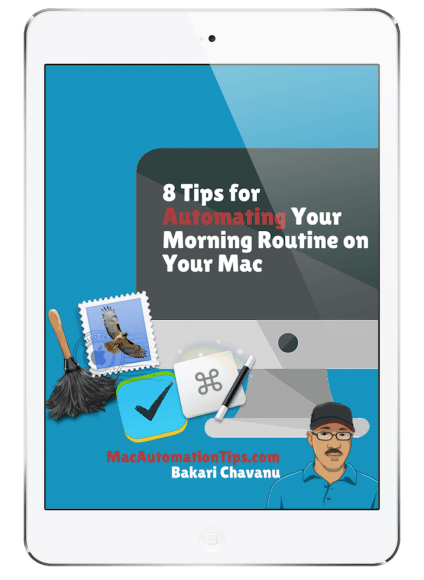 For instance, the Wake trigger could be used to automatically play iTunes or Rdio when my Mac awakes between a specified time of the day. The clipboard trigger might be useful for triggering a macro that switches me back to a specified application if specified text (e.g., a URL that includes an iTunes.apple.com link) is included in the System clipboard. The Focus Window trigger could be used to automatically open a specified application when a particular folder is opened in the Finder. The Periodic trigger could be used for activating Mail or opening a specified website periodically throughout the day, on specified days. And the Mounted Volume trigger could automatically eject a mounted camera memory card after it has been mounted for a specified amount of time. It’s really awesome to see that KM can now keep track of how many times a macro runs, and it filter macros by times ran. The count number of course starts with with 7.0 version. Over time, this new feature will help me sort out macros I’m not using. Selecting a macro, and then clicking on Window > Macro Inspector reveals information about about the macro, including the last time and date used, and the overall approximate amount of time saved by using the macro. 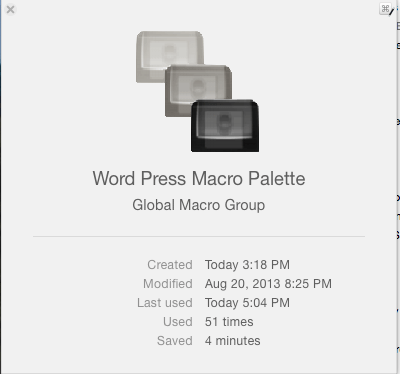 Macro palettes are very handy for clicking and activating macros when you don’t use hotkey or string trigger. In the new update, you can stylize default, global, and conflict palettes. This feature is found in KM Preferences, and it includes different color palette styles, an opacity adjustment, text size adjustment, the ability to shrink a custom palettes, and options for showing the trigger, text, and icons of listed macros in a palette. Though I don’t use the global palette that often, it’s great that macro titles can now be listed in two or more columns, instead of a long single column. I’ve only highlighted a few obvious new features and changes in KM 7.0. In the coming days and weeks I’ll share more tips and how-tos for getting more out of the new upgrade. If you’re an experienced user of KM or recently started using the program, I would love to get your feedback about the new upgrade, and what new features you find helpful.